Visualizing extracellular vesicles (EVs) in cells and organisms has been technically difficult due to the high background from auto-fluorescence in the UV and visible areas of the spectrum and a lack of specificity from the typically lipophilic dyes. SBI’s ExoGlow-Vivo EV Labeling Kit (Near IR) is the first reagent specifically designed to overcome these problems through the use of a proprietary, non-lipophilic dye that emits in the near infrared (NIR) range (excitation at 784 nm; emission at 806 nm). Delivering a level of specificity and sensitivity that takes the guesswork out of tracking EVs in vivo, ExoGlow-Vivo is ideal for EV biodistribution and kinetic studies needed to fully realize the value of EVs in basic research and translational applications. Each kit includes lyophilized dye sufficient for labeling up to 12 samples*. We recommend solubilizing the lyophilized dye in 25μL of DMSO. *One sample is defined as 2 μL of solubilized dye with 250 μg protein equivalents of EVs. Figure 1. ExoGlow-Vivo labeled EVs show robust signal in vivo. A. HEK293-derived EVs isolated using ExoQuick-TC were labeled with the ExoGlow-Vivo dye and administered intravenously via the superficial temporal vein into post-natal day-4 C57BL6 mice. 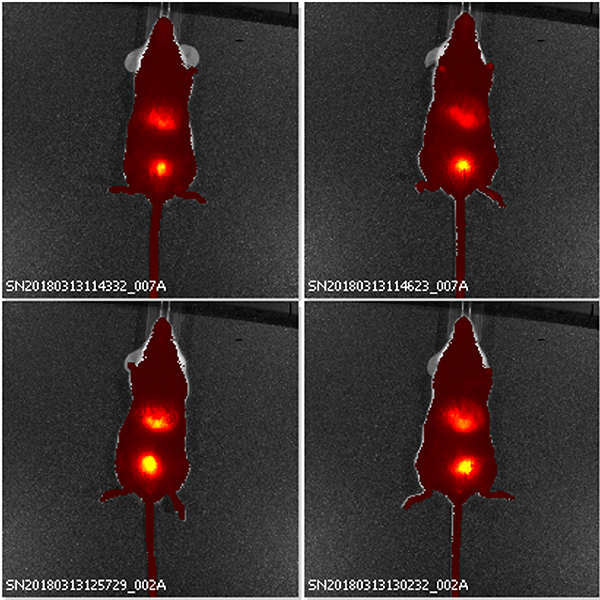 Animals were imaged at various time points using IVIS® In Vivo Imaging System (PerkinElmer). B. Dissection after 24-hours shows the preferential accumulation of labeled EVs in the liver and kidneys. Data courtesy of Gareth Willis, PhD., Harvard Medical School and Boston Children’s Hospital. Figure 2. ExoGlow-Vivo dye delivers minimal background. A. Human mesenchymal stem cell-derived EVs were labeled with ExoGlow-Vivo dye and unbound dye removed via ultracentrifugation and a wash. EVs were administered intravenously via the superficial temporal vein into post-natal day-4 FVB mice. Animals were imaged at various time points using an IVIS® In Vivo Imaging System (PerkinElmer). Control refers to supernatant from wash step (i.e. free dye). B. Dissection after 24-hours shows the preferential accumulation of labeled EVs in specific organs and very low residual background signal from free dye. Data courtesy of Gareth Willis, PhD., Harvard Medical School and Boston Children’s Hospital. Figure 3. ExoGlow-Vivo enables kinetic analysis of EV persistence in living mice. A. Human PBMC-derived EVs were labeled with ExoGlow-Vivo and administered via tail vein injection into SCID mice (m3 and m4). Animals were imaged at various time points using an IVIS® In Vivo Imaging System (PerkinElmer). B. Plotting signal intensity in different organs (liver, bladder, head) as a function of time after injection shows that EVs are rapidly taken up by target organs within 90-minutes of injection and decline at different rates over time. Data courtesy of Sam Noppen, Rega Institute KU Leuven, Belgium.